Recently, my father handed me our passports for renewal. They were all set to expire in about 10 months and he wanted me to get them renewed. As soon as I saw the passports, it reminded me of all the hassles we had gone through around 10 years back when we had applied for a new one. Though I don’t remember much of the process now, as dad had handled most of it at the time, but I do remember visiting the police station twice. First visit was mandatory and second, because of some document issue. I also remember the waiting times that had ensued on our arrival in the police station. - Would there be a visit to the police station involved? - Would the process be cumbersome? - Would there be huge waiting lines to be crossed before I could get our new passports issued? - Would I need someone’s help to do it (a paid mediator? / agent?? ) or am I capable to do it all by myself? With so many queries running in my mind, I wondered – Damn. Why the passport was even expiring in the first place! Anyway, that was before I renewed the passport. Thanks to the online procedure by the Ministry of External Affairs, today, I have a brand new passport that is all set to take me through the next ten years and hopefully some more newer places, countries and locales (The previous one took me to Japan and Melbourne). I am giving my experience about the passport renewal and the procedure below just in case anyone else comes here searching for help about the same. It’s really simple, so don’t worry, just start and make sure to follow the instructions right till the very end. 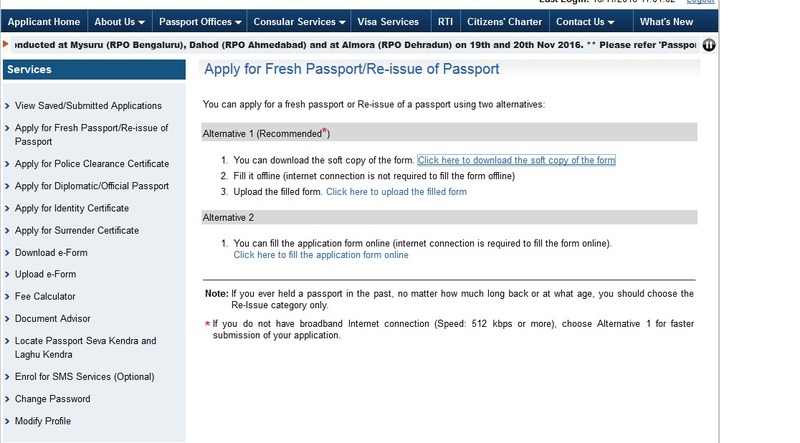 Step 1: Register on the passport seva portal. First, log in to passportindia.gov.in and register as a new user by filling up all the basic details like name, surname, date of birth and passport office as per your current city of residence. You will get an activation email in your registered email id – click that and voila – you are all set to proceed onto step 2! Step 2: Fill in the required forms. Alternative 1 is where you download the soft copy of the form, fill it offline and upload it later. And the second alternative is filling the application form online at that time itself. Note that choosing this alternative would require a good stable internet connection. Pick Alternative 1 and fill the form online. The site recommends going for alternative 1 perhaps because many people don’t have the complete details required in the form available at hand which then proves to be a hassle. The recommendation sounded like a more viable option to me as well so I opted for that. - PAN, Voter ID and Aadhar Number. - Since when are you residing in your permanent residence? - Name, address and telephone numbers of 2 references in case it is required for verification purposes. (Note here that I was instructed at the centre that the references HAVE to be that of your neighbours only and not your friends, co-workers, etc.). Apart from these, details of your - about to expire passport will also be required, so make sure you have that handy. Step 3: Upload the .XML file. Select No for Passport Seva SMS seervices. After filling the downloaded e-form, come to the website again and enter the state and police district and click the 'Validate & Save' button. Save the XML file generated which is then required to be uploaded again in the system through the 'Upload e-Form' link. 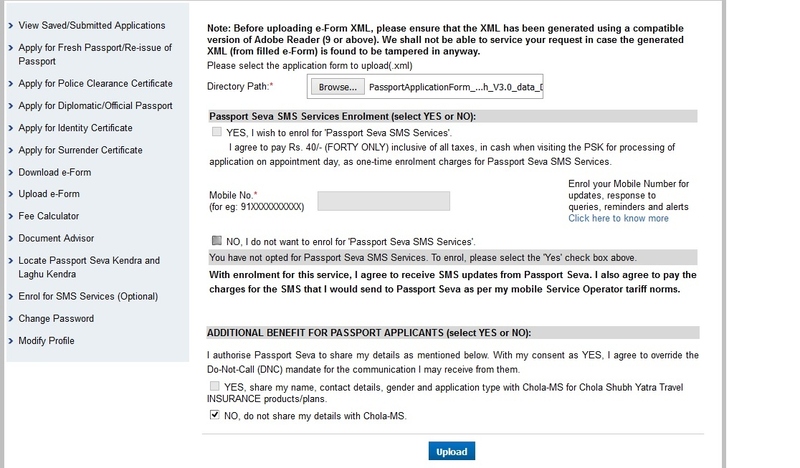 Just below the Upload option, you will see 'Passport Seva SMS Services Enrolment' where you have to select Yes / No whether you wish to enrol for the services. While filling the form, I had selected Yes thinking that it might be useful for receiving updates on the progress of my passport. Later at the centre (B counter) I came to know that the enrolment came at a price of Rs. 40/- and the girl at the counter told me that it was not needed. Thanks to her, I unchecked the option there and she was right indeed! Step 4: Pay and schedule an appointment. Click on the 'View Saved / Submitted Applications' page on the left hand side to schedule your appointment at a Passport Seva Kendra. Select your application and click on 'Pay and Schedule Appointment'. Select the most convenient Passport Seva Kendra and a suited time slot from the options available. Once that is done, you will be taken to the payment page. After the payment, print the application receipt containing the Application Reference Number (ARN) / Appointment Number. Check if all the details are fine and keep it securely with yourself. 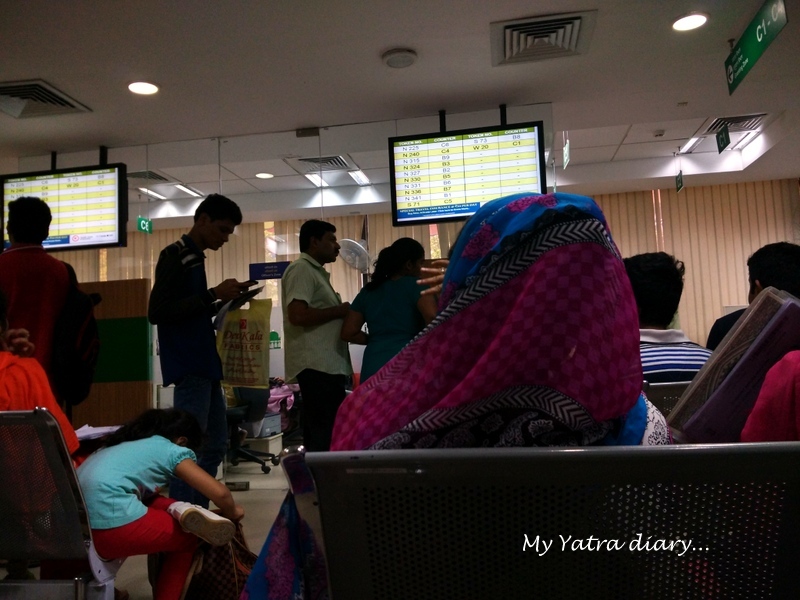 Step 5: What documents should I carry at the Passport Seva Kendra? Please note here that the list of documents vary in case of change in address as printed in old passport or in case of addition of spouse name. For the complete list of documents to be carried with you, please check the Document Advisor for renewal / re-issue link on the home page, choose your relevant case and it will show the list of documents that you will need. Original Old Passport that is expiring or expired. Photo copy our passport first page, last page and the page with ECNR info. We did self-attestation (our own signature) on all the pages. Photocopy of Aadhar card (front and back side) self attested again. Application receipt with the Application Reference Number (ARN)/Appointment Number. Step 5: Grab your appointment at the Passport Seva Kendra. Visit the Passport Seva Kendra where appointment has been taken, along with original documents atleast 15 minutes earlier than the allotted time slot. We had booked for 8.30 AM in the morning. We reached the place at around 8 and stood in the well-organised queue outside the gate. At exactly the allotted time, we were taken in. The service executive at the front desk checked all our documents and handed a 'B class' token number. My token for the B section was called on after about 30 minutes: the girl checked all my documents quickly and took my fingerprints and a fresh new photograph for uploading it on the renewed issue of the passport. While giving my photograph, I just smiled but later came to know that it’s perfectly okay to show some teeth as well! After the B section was done with, I was issued a 'C class' token and was forwarded to a different room. Here, chairs were neatly lined and the room was finely air conditioned so that around 1 hour of my waiting period passed away in a jiffy. Seating facing the C counters. The token numbers along with the counter numbers are displayed on the monitor. The counter person just checked all the documents and it did not take much time at all. Lastly, there was one more checking done at the last counter (Same token number - C section – part 2) before we were directed towards the exit door for the acknowledgement copy. The entire process took around 2.5 hrs to 3 hrs and was a smooth experience owing to the discipline maintained by the staff in following the entire process. The very next day, I received an SMS saying my passport had been dispatched along with the Speed Post tracking pin number. The passport came home successfully the day after, delivered right at my doorstep in my hands. When should I go to Passport Seva Kendra? If you have got a slot, go at that exact time or 15 min before, no need to go there and sweat. What if I forget one of my documents? It's good to have all the original documents along as well. My brother forgot his adhaar card photocopy and had to get it done at the seva kendra itself. The seva kendra has a photocopy machine inside so that is not a problem but it does eat your precious time. What if there is a mistake in the online form I filled? No worries. The person at the B counter will be asking you to recheck all your details again, so you can tell them about any mistakes you may have made in the online form and they will correct the same. What is the difference between Reissue and Renewal? Passports are no longer renewed, they are reissued. Both the terms are used interchangeably as they both mean the same. Thanks for helping out by posting the process.. My pages are finished.. will have to re-issue new passport, This will help me. Thanks for the post informative post. thanks for info. What's the reissue fee? That's a good question, Shilpa. The reissue fee is Rs. 1500/- Thanks for asking! Thanks Arti for the detailed step by step information. Nice blog...and happy new year! Thanks for the steps. Recently my husband and my sons were getting expired. So I had to accompany them since they r minors. just reminded me of abc queues. But the best part was that this time there was no visit to the police station. Your post is really helpful. I'm about to apply for a renewal for my passport and I had a question. When I applied for my first passport I did a name change and for that I submitted all my documents. Now for the re-issue, I would need to submit documents for ECNR again. I wanted to know that since on my matriculation certificate, my name is different than the name in my current passport, would that affect me? Will I need to re-submit all my documents pertaining to the name change? I'm so confused! There is NO Step 3 involved when i fill the application form June 2017. Thanks for the information :) It really helps a lot for me. Hope there is no police verification required again in order to reissue a passport. Why did you have to carry aadhar copy too? Is that for address proof? Not sure if it is for the address but it has to be carried it as per the rules and documents required by them. Thank you for detailed information. As you mentioned documents can be varies in case of addition of spouse name. Could you please let me know what are the documents required for the same. One more important question that you mentioned next day you received passport so no police verification required? I want to change my photo as appearing in passport from beard to non beard. Whether reissue of passport require police verification since all other particulars remains same? Beside The Seaside: Celebrating Beach Holidays!